The family moved to Bakersfield, Calif., in 1942 where Norm graduated from East Bakersfield High School and Bakersfield College. He played sports and was in plays such as “Madam Butterfly” and “The Front Page.” He also enjoyed singing with the Barbarashop Quartet Association. Norm married Elizabeth (Libby) King in 1957. He is survived by Libby; two children, Mitchell (Pat) and Mary Kim Murrell; two grandchildren; five great grandchildren; and his brother, Jim Murrell. At Fresno State he earned his Bachelor and his Master degrees in teaching and arts. After returning to Bakersfield, he taught school for Bakersfield City Schools for five years. 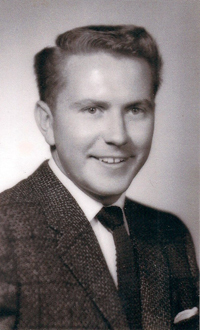 In 1964 Norm had the opportunity to teach school for the Arabian American Oil company in Saudi Arabia. He jumped at the chance and the family moved to Dhahran, Saudi Arabia. After eight years with the Dhahran Schools, Norm joined Industrial Relations. In 1974 he transferred as a recruiting advisor to Aramco Services Company in Houston, Texas, where he helped establish an orientation program that served more than 2,400 people over the next few years. The Murrells returned to Dhahran in 1978 and Norm retired as a planning and programs analyst with Exploration in 1986. Norm was also active in the theater group, singing and dancing in “Oklahoma,” “South Pacific,” “The Makado” plus “Taming of the Shew,” “Never Too Late,” “How the Other Half Loves,” plus many others. The family made many camping trips visiting Bedouins and seeing the ancient sights while in Saudi Arabia. Traveling was their passion as they visited 55 different countries. For many years Norm talked to schools and organizations about Saudi Arabia and the Middle East. When the family returned to Houston, he taught for seven years in the Klein School District. In 1996 Norm and Libby decided to return to California and ran their Sierrahouse Bed and Breakfast in Mariposa for several years. A memorial service will be held Saturday, March 17, 2018 at 11:00 A.M.at the Masonic Hall in Mariposa.